I'm so excited! 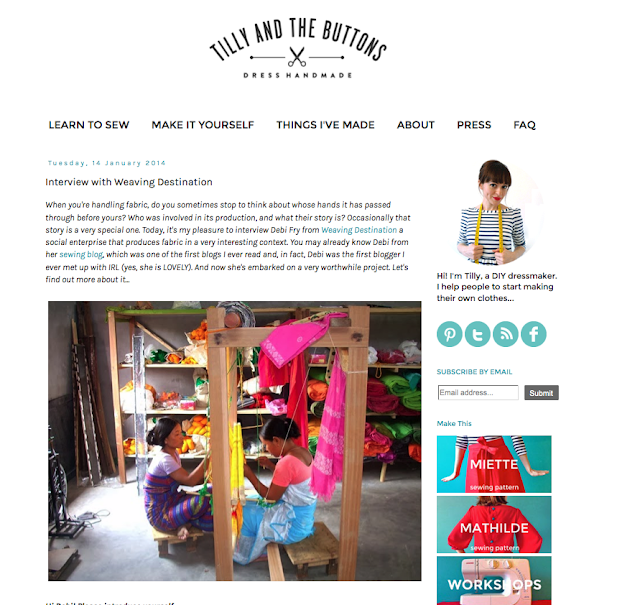 The lovely Tilly from Tilly and the Buttons interviewed me about Weaving Destination. Check it out here. Thank you so much, Tilly! And Weaving Destination was also featured in the latest issue of Threads magazine. We feel so blessed! Thank you for all your support! I've really enjoyed reading this interview Debbie, well done! You and the women are inspirations. Yay! What a great interview! I'm so excited about all the new things you guys are up to, and I can't wait to get my mitts on some eco silk! Its a fabulous interview! I love the pink border fabric in your shop too! You and all the women are amazing. I'm so excited for you guys! It's such a wonderful thing it deserves all the recognition it can get! I really enjoyed that interview, it is such an important thing to shed light on. It is easy to forget that not all women are as blessed, and free in their choices as we are. I think a little help from us goes a long way, and just getting the word out will make the snowball rolling. I admire your work, Debi! I've come over from Tilly's blog. I really enjoyed the interview and I'm really glad I know about weaving destination now. I've looked on the etsy page; their work is really beautiful. Well done for all the work you do to help women. Even in modern times women need that help and support. What a great interview! I loved learning about this! I will definetly be purchasing some fabric! Well done Debi. Glad to see things are going from strength to strength! So I hear there's to be a second season of Great British Sewing Bee...all my bets lay with you being on it!